as you probably know we release new version about every month. And because new month is here also the new version Locus was released. 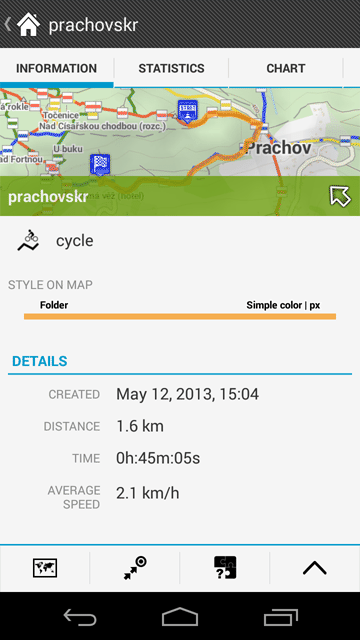 Version 3.3.0 is small revolution in track management and brings new auto zooming feature. Do you remember an ugly checkboxes in the list of points and tracks? Did you know how to show data on a map? They’re gone now and are replaced with eye symbol or checkbox when you decide for bulk edit or export. Also the names of points are more visible. But the list of track has more improvements. 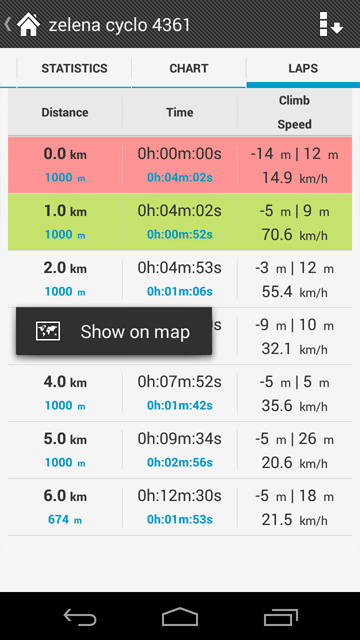 With the new version you can see basic statistic about track without opening the details and small map thumbnail shows you the location of track. Let’s try to tap on the map thumbnail and Locus displays whole track over the map. Multi select for bulk edit or export is similar to list of points. Tap on tools button in bottom panel – select the tracks and choose action you want to perform. The big changes come with the track screen which looks similar to point screen. 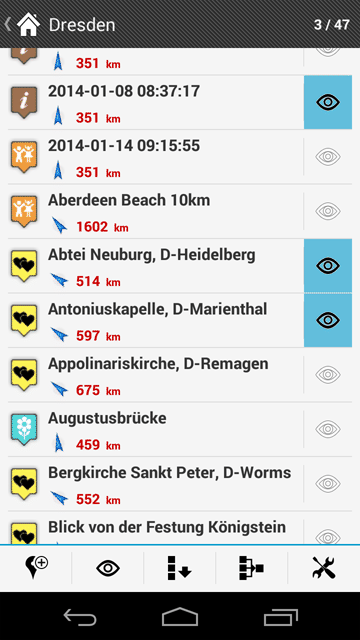 There are new tabs that show basic data, detailed statistic and the last tab brings the laps information – the most wanted feature of sport enthusiast. Select the length of lap or track part and Locus splits the important statistic between the particular parts. You can even show the specific track section on the map. Locus has already offered auto-zoom in previous versions but this feature was complicated to use. For this reason we’ve prepared automatic auto-zoom feature (Menu > Settings > Maps – advanced > Autozoom). 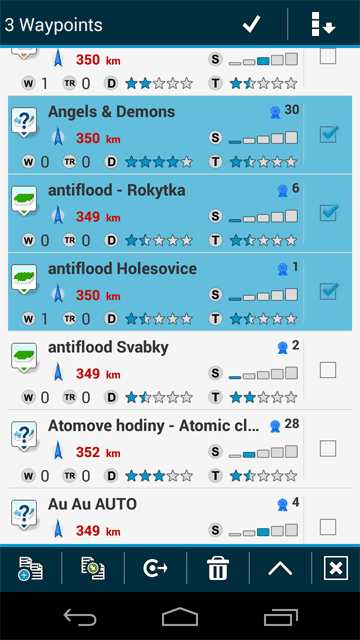 If it enabled Locus automatically change to zoom of map based on your speed which can be very useful for guiding or navigation. After upgrading to version 3.3.1 map rotation doesn’t work. As I turn I want the map to rotate so I always have the view of traveling up the screen. Can you add map in Locus? is this correct [Points and tracks manager] ? Recorded Track is a Track. Recording Track is a Active Track. Tracks in database are Trails. A track is red color by default. Trails are blue color by default. Is there no distinction between [a Track] and [Traces] ? 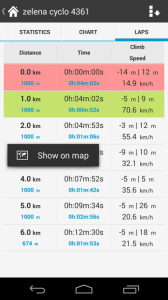 (1) “Recorded track” and “Track recording” are drawn with red color in map viewer. 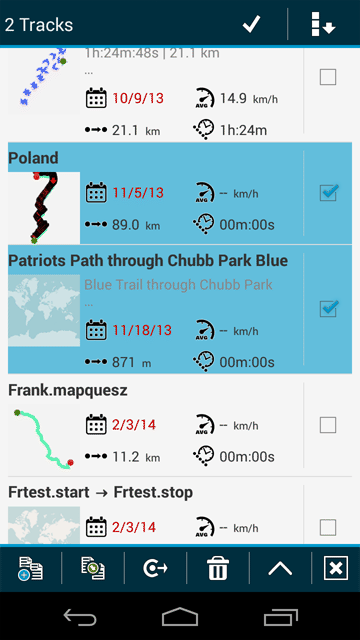 (2) “Saved track” and “imported track” and “manually created track” are drawn with blue color in map viewer. every track in Locus has two possibilities for its appearance (open details of track and choose tab “Appearance”). When you submit SAVE for recorded track you can choose (in the latest version 3.3.1) if you want to use style of folder or style of track. The default color is the blue one. For this reason have your saved track the blue color. 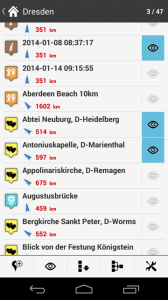 (1) “Track recording” is red color in map viewer. (2) “Recorded track” and “imported track” and “manually created track” are blue color in map viewer. (3) “Route” is pink color in map viewer. What difference between (1), (2), and (3) ? Petr, great program I love it! With the new update to 3.3.0 I lost the ability to autozoom. I click it on as you direct but the zoom never changes, I had the zoom setting just right and now there is no autozoom at all, i even tried to clear all temporary data. 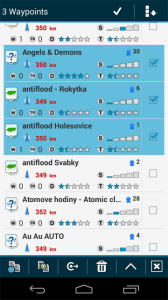 After update to version 3.3.0 I see only two of my private maps, from 51 of them. I’m sorry for troubles. There is really bug in the latest 3.3.0 version -> it’ll be fixed in next 3.3.1 version. Il s’agit de locus pro . Google Maps ne sont pas au moins deux ans pris en charge car les conditions d’utilisation. Vous avez probablement utilisé non pris en charge complémentaire sur la carte: tordre qui n’est pas développé par l’équipe de Locus. Please would it be possible to add a date format for the data screen as I split my tracks into folders and would prefer the DD/MM/YY option. And if possible a compact view that doesn’t show the thumbnails so you can get more on screen, as it was in the last version. Epic software, by the way. I’ve tested many like Backcountry and Orux and Locus is the winner for many reasons. The new tracks screen looks great 🙂 I gave just one small question – how do I select an individual point of the track? For example to edit its location. open details of track > from bottom menu choose “Edit on map” > select point of track (using arrows or taping o it ) and finally edit the point. this is actually not quite correct – all I have to do is tap on a track in the list, wait until the map at the top is displayed, and hit the “Back” button. Looks very cool. But in my track list, all thumbnails are just pictures of the map of the world with no track data. the thumbnails are generated when you create or save new track. So open detail track screen > open edit and save it. Generation of thumbnail is complicated process and is performed only when track is saved.